Bruxism (Teeth Grinding): What Causes It? It is not always possible to determine the cause of bruxism, but there are some common causes to consider if you are experiencing this issue. If you are experiencing stress, it can show when you grind your teeth during sleep. Your fears, worries, or anxiety can lead to teeth grinding. Some people are naturally competitive, aggressive, or angry. Others may have suppressed frustration. These issues can lead to teeth grinding. Some medical problems can increase bruxism. It can be a side effect of Parkinson’s disease or Huntington’s disease. Individuals who have earaches, and young children who are teething, can be prone to grinding their teeth. Grinding can also be a side effect of some medications. 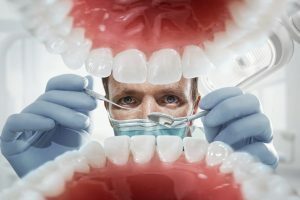 A person who has missing or crooked teeth, or a misaligned bite, is more likely to grind his teeth during sleep than a person with ideal dental health. Bruxism is harmful to dental health, too. Consistent grinding can wear down tooth enamel, increasing the risk of tooth decay. If grinding is extreme, it can even cause teeth to become loose. Someone in your family has informed you that you grind your teeth, or you have noticed some of the symptoms. There are many symptoms, including a sore jaw, dull headaches, earaches, and facial pain. If you know or think you are grinding your teeth at night, consult with your dentist. In most cases, the simplest solution is a mouth guard. All you need to do is insert this comfortable device before you go to bed at night. You can have a full night of restful sleep, and protect your teeth at the same time. It is an easy way to prevent the problems that come from teeth grinding.